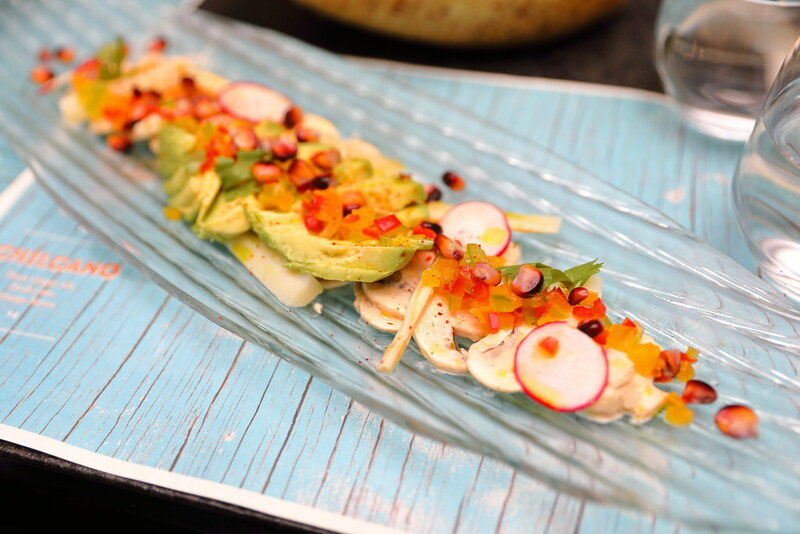 The first ever Peruvian Cevicheria, Tono Cevicheria has landed on our shore at Duo Galleria. 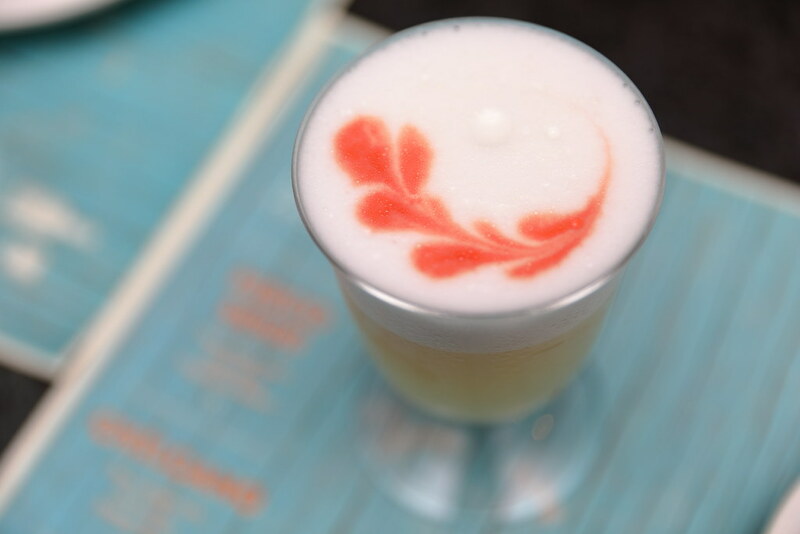 The restaurant is the brainchild of Peruvian Chef Daniel Chavez, co-owner and chef of OLA Cocina del Mar at MBFC. The kitchen at Tono Cevicheria is headed by Executive Chef Mario Malvaez with a dynamic team of Lima-trained Latin American chefs. 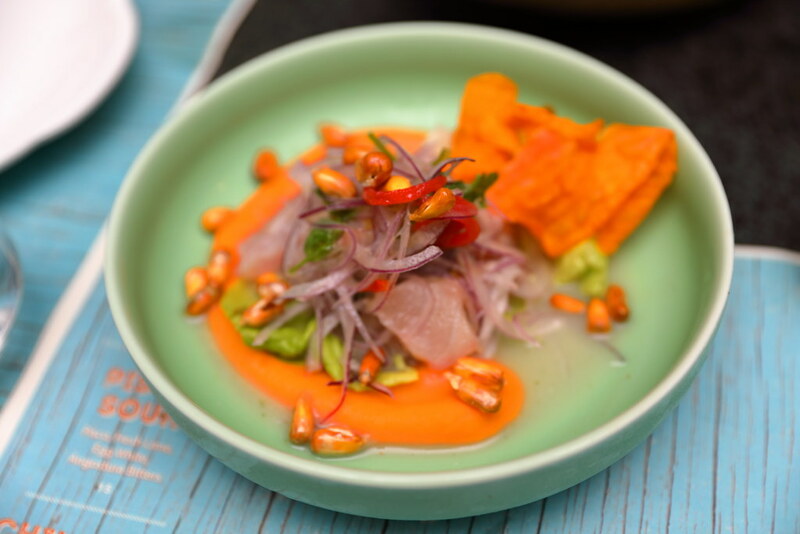 Using line caught fish from New Zealand is the Clasico Ceviche ($25) which is a classic ceviche that can be found in any household and cevicheria in Peru. In the plate, you can find fresh fish meat, thinly sliced onion, white tiger's milk, lettuce, coriander, chilli and lime juice. They are many flavours at play but they all come together as a beautiful dish. 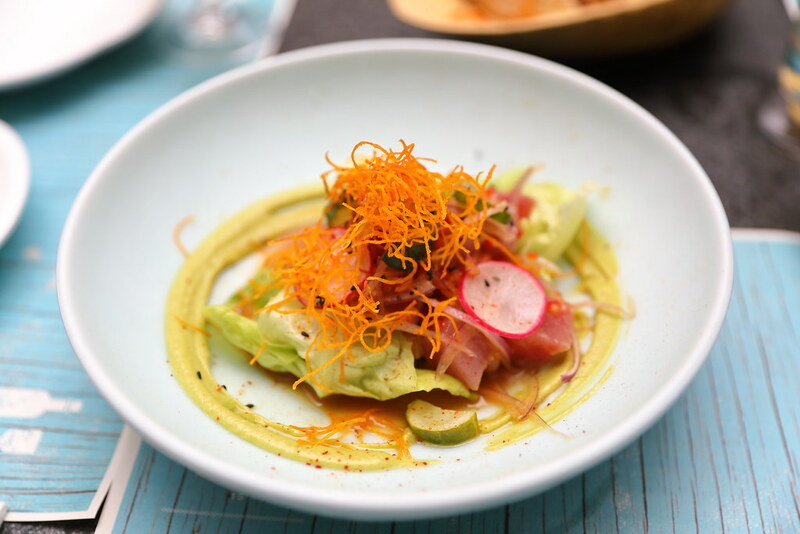 The Nikkei Ceviche ($24) is Japanese influenced using a concoction of dashi, mirin, soy and chilli to pair with the raw yellowfin tuna. It comes with purple potato chips and avocado puree. I thought the soy is a bit overpowering. I still prefer the clasico ceviche for its sharp flavours. Avocado ($24) is a vegetarian dish on the menu. It consists of avocado, mushrooms, lime vinaigrette, heart of palm, blue corn and sweet potato chips. An enjoyable dish packed with different textures. I thought Peruvian cuisine is all about raw fish until I had the Solterito ($24) which consists of crispy white fish, fava beans, canchitas and feta cheese resting on a bed of potato mash. The potato mash has a tangy zest to it which is very appetizing. 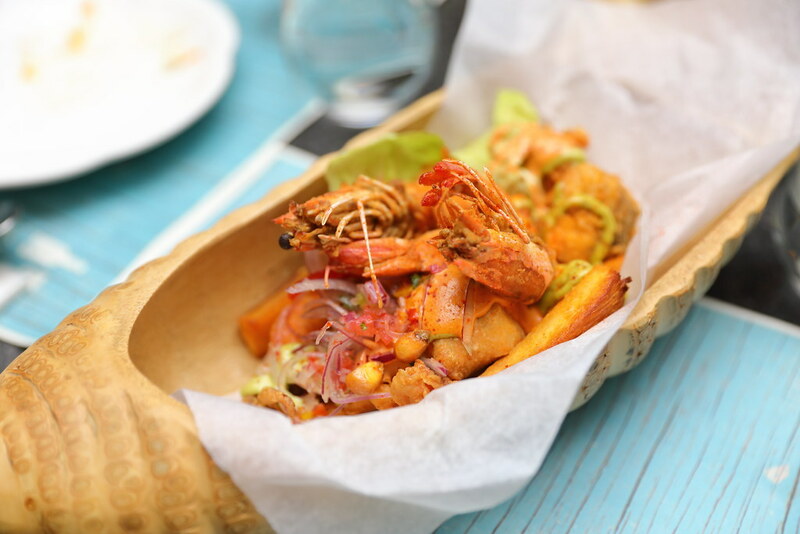 The Jalea ($32) is basically a fried seafood basket. 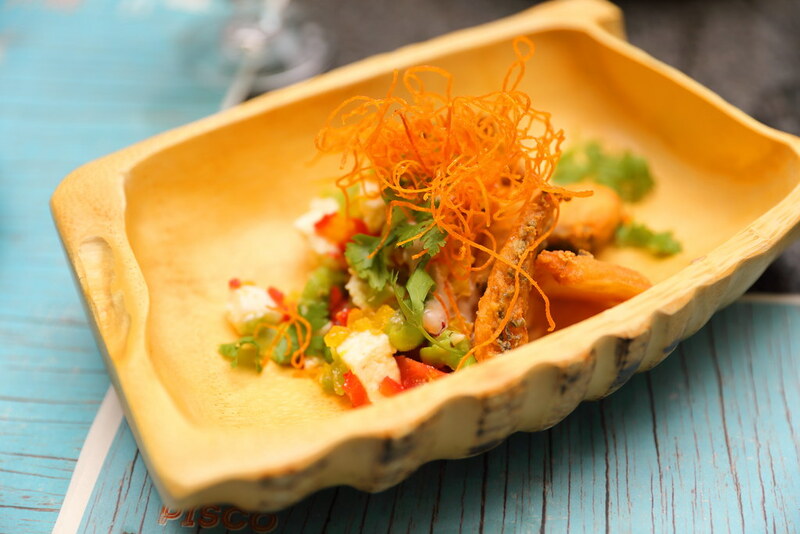 In the basket, there are crispy calamari, fish, prawn and octopus. Besides the seafood, there are other items such us tapioca chips, salsa criollo and smoked chilli mayo. 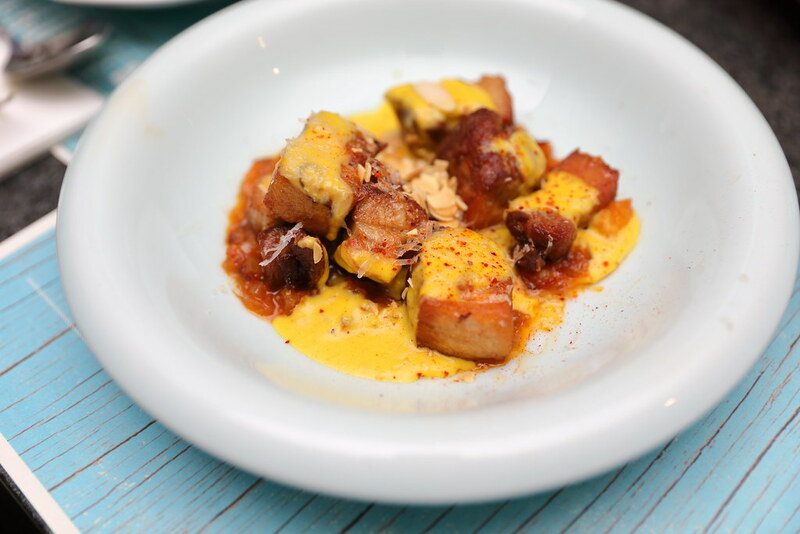 Another fried item we tried is the crispy pork belly, Chicharron ($28). The pork is dressed in a smoky chilli and amarillo sauce. The combination of the cheesy sauce surprisingly works wonderfully with the crispy pork belly. 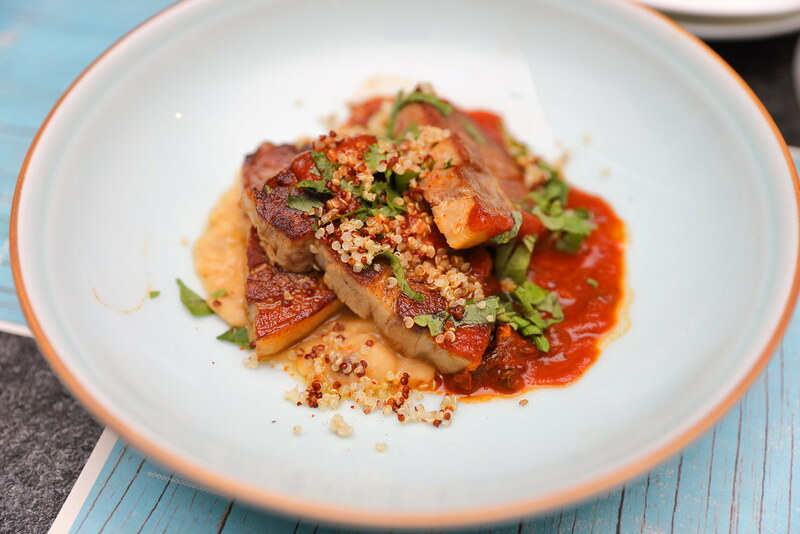 The Huaita ($32) is a slow roasted pork dish with bean stew, dressed in mint and coriander sauce. It is also topped with some quinoa. The pork is cooked to a nice fork tender but the flavours did not have that wow factor that will make me jump up from my chair. Cooked in a housemade fish stock with onions, garlic, oregano, tomatoes, white wine, lager, cumin and pumpkin is the Aguadito ($28). 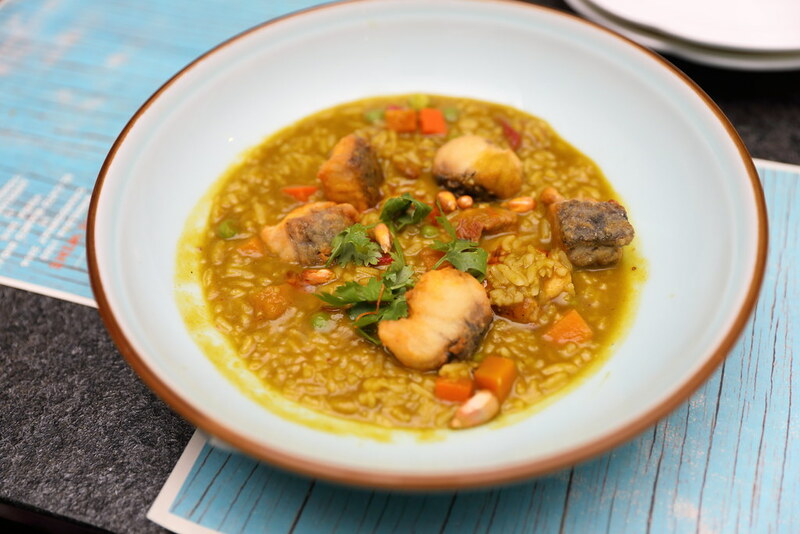 The comforting bowl of soup with long grain rice, crispy fish, chicken, pumpkin and canchita was the highlight for me. The dish has great depth in it, with the different flavours working harmoniously as one. 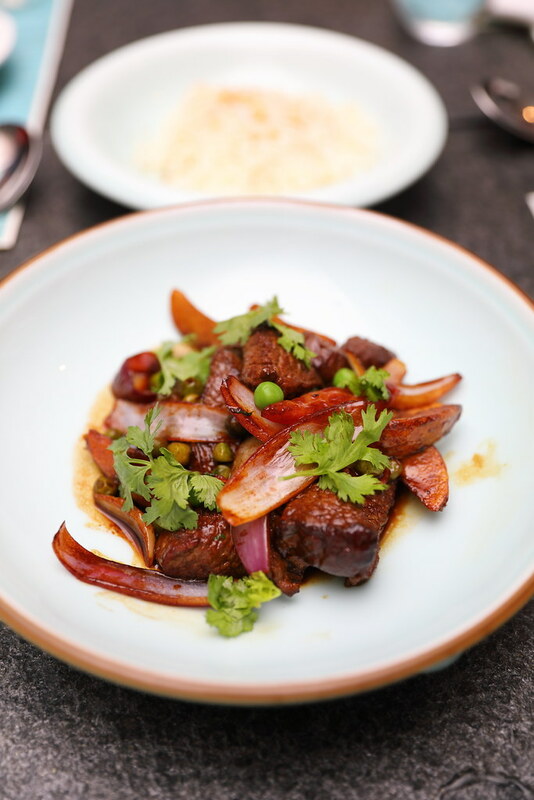 The Lomo Saltado ($40) is a traditional stir-fried beef dish with tomatoes, onions, coriander and crispy potatoes. This is definitely Chinese influenced with the used of light and dark soy too. Best to go with a bowl of rice. Moving to the dessert, we tried the Combinado ($12). 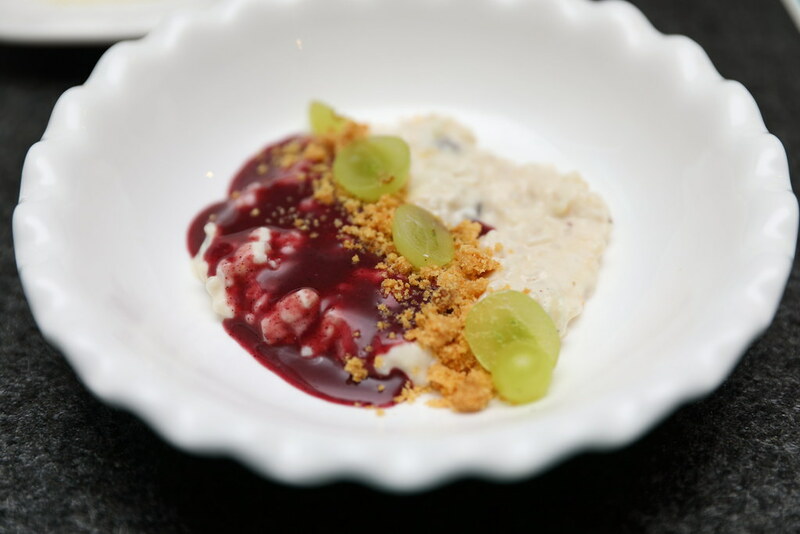 It is actually vanilla rice pudding and purple corn mazamorra, topped with grapes and apple cubes. A rather interesting dish which felt like having oatmeal for breakfast. If I have a choice, I would have the Alfajores ($12) for dessert. 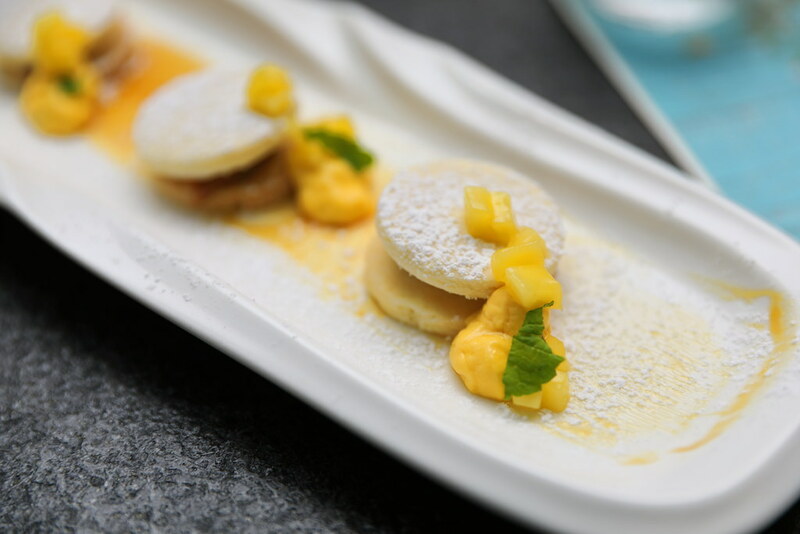 The Dulce de Leche filling and mango mousse is sandwiched with butter cookies and dusted with icing sugar. A delightful sweet and sour combination to wrap up your the dinner. Note: This is an invited tasting.